A problem with multiple barycenters at asteroids, comets and planets I have also noticed in my quadruple planetary system. When I give the barycenter no mass, appears the main barycenter in the system browser in the correct position. However, it does not open, if I make a right click on it. So I have no access to the planets. When I give the barycenters mass, the most massive of the sub barycenters appears in the system browser, in the wrong position, but I then have access to the planets. So this has a certain advantage. I do not really think that is a bug. SpaceEngine is simply not yet adjusted to multiple non-solar barycenters. As far as I understand, Johnson's archive is strictly a collection of data regarding multiple bodies from bulletin announcements, various papers and other databases. I think diameters are collected in this way, not calculated from existing data, so in this particular case the source of that value is unreachable, we do know there's a lightcurve analysis involved, but that's it. whoever wrote the wikipedia article did the math. More importantly, I guess there are not yet enough data in order to calculate an orbit. TC36 revealed a bug in SE with object with multiple barycenters. 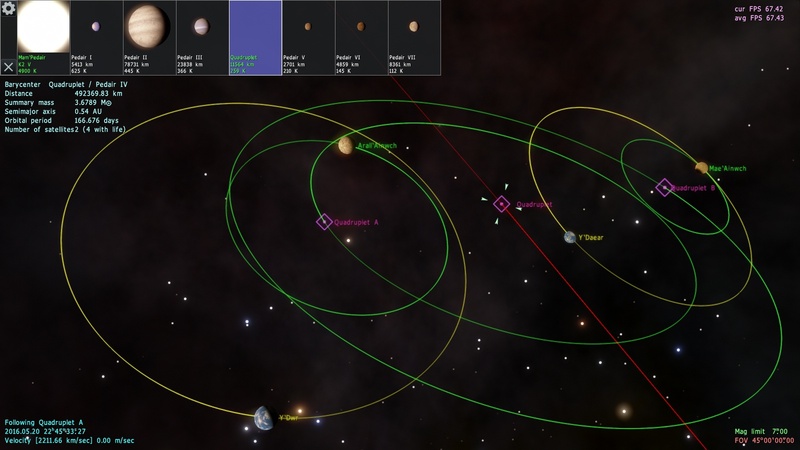 It bugs out orbit rendering, and always shown in solar system browser. It is fixed for the next version. 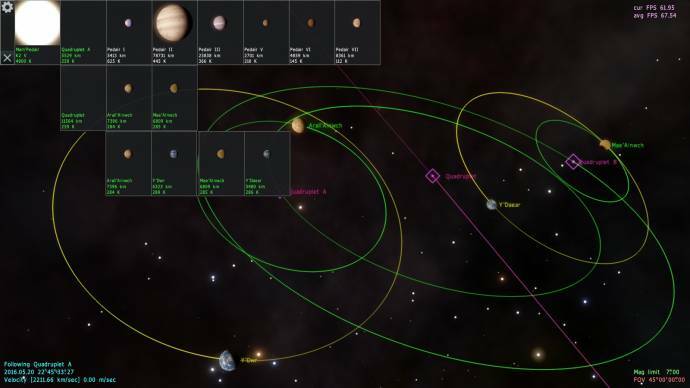 SS browser will also have an option to display planetary barycenters - this will allow to access planets orbiting them. Also, keep in mind that slash is used to separate names, no name like "S/2013 AB1" will be loaded as two names "S" and "2013 AB1". Removing slash is a solution for now. Since the barycenter issue will be solved in the next SE update, instead of removing data that could be useful, I'd say it's more convenient commenting the lines (//) containing the Mass value from Barycenter objects, until the new update is out. I guess RC3 users on Steam will not be affected greatly by this temporary change. And seeing as that problem is dealt with I will just leave this here. 121 Hermione, 283 Emma, 317 Roxane, 379 Huenna, 4674 Pauling, and 7225 Huntress. and always shown in solar system browser. did you mean this? It's fixed for next update. yeah, I'm telling myself the same since at least 20 asteroids ago. I don't think multiple spoiler buttons will help, maybe a fixed-width table structure it's the best for reading, not to maintain though. I'm open to suggestions. yes it is, in the end it will be the solution. A table-like solution I was contemplating is for better reading when the numbers are increasing. Asteroid "1990 TR/(5646) 1990 TR"
7369 Gavrilin, another Mars crossing asteroid. 17246 2000 GL74, 22899 1999 TO14, 2004 Polonskaya, and 42355 Typhon a binary centaur. Even though I have already expressed my opinion on the use of barycenters where the mass of both objects is not known (I am against it) I just thought I should point out that when using barycenters on an object that is not given an obliquity SE will not randomly generate one. This leads to many binary asteroids having orbits aligned with the ecliptic. Asteroid "1999 TO14/(22899) 1999 TO14"
Asteroid "2000 GL74/(17246) 2000 GL74"
Ishtar looks unrealistic, especially in dynamics: bigger asteroid rotates within 3 hours, while smaller rotates around bigger within 20 hours. Maybe size of the satellite asteroid is too big? The image is a simple result of a batch file originated from another file, is actually less time consuming than placing the names manually in OP. The list ordered by number I think facilitates anyway the detection of a missing number. Also, with the number of objects increasing, I came to the conclusion that making a list in OP soon will be basically not practical, and I'd encourage anyway the search for names from the updated script itself. 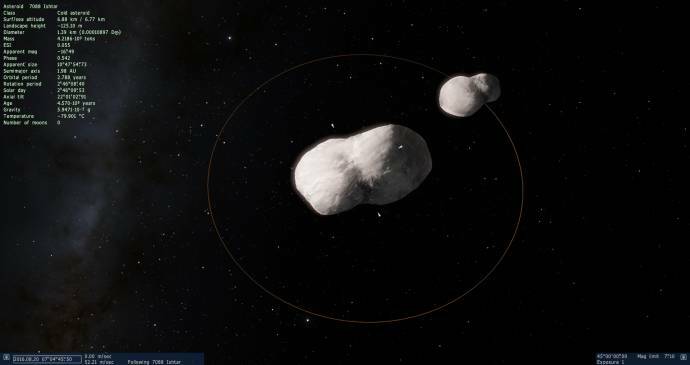 Asteroid "1998 PG/(31345) 1998 PG"
702 Alauda, 809 Lundia, 854 Frostia, and 939 Isberga. Also the systems Litva, Balam, and Hermes need to have all of their components changed from "DwarfMoon" to "Asteroid". DwarfMoon "Pichi unem/Alauda I Pichi unem"